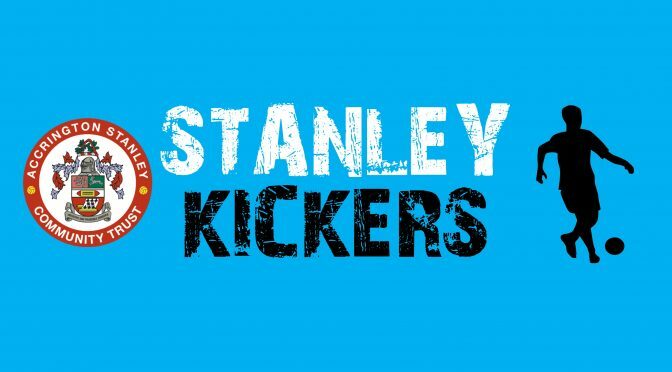 Stanley Kickers is designed to cater for children aged two to four years old who are taking their first steps into football. They are parent friendly, child specific and provide an introduction to the basic skills of football. Each child works with their own ball and this enables them to learn to master ball skills from an early age. Improve body awareness, mobility and fitness. Develop initial literacy and numeracy skills. Our carefully planned programme is about a great deal more than just developing your child’s affinity with football, it is about giving them a well-rounded start in their physical, social and educational development and developing the ‘whole child’. Our structured sessions allow parents to spend quality time with their child, safe in the knowledge that they are helping to develop the ABC skills of Agility, Balance & Coordination. This approach ensures that children are learning to build the foundation of a healthy lifestyle and are beginning a lifelong relationship with sport and physical activity. The classes are structured in such a way that parents are able to take away short activities to play with their children at home. We actively encourage you to practice at home, thereby promoting physical activity throughout the week and encouraging structured play. This type of activity forms a vital part of a young child’s development and lays the foundation upon which all later learning depends. Sessions follow a familiar format each week, as regular routines help children to feel secure and gain confidence. Children and parents also get the opportunity to share those first unforgettable, goal-scoring adventures. We accept all major credit and debit cards through our PayPal Gateway. We advise that you book online prior to the course starting by using the above link.